The Federal Open Market Committee meets today, its second of 8 scheduled meetings this year. As a home buyer or would-be refinancing household in Murfreesboro , get ready for changing mortgage rates. The Federal Open Market Committee is the 12-person sub-committee within the Federal Reserve that votes on the nation’s monetary policy. Led by Federal Reserve Chairman Ben Bernanke, the FOMC’s most prominent role is as steward for the Fed Funds Rate. The Fed has said repeatedly that it intends to keep the Fed Funds Rate near 0.000 for an “extended period of time”, through 2014 at least. Unfortunately, this doesn’t mean that Brentwood mortgage rates will remain low as well. Mortgage rates are not set by the Federal Open Market Committee. Mortgage rates are set by Wall Street. As proof that the Fed Funds Rate is distinct from mortgage rates, consider that, since 2000, the difference between the Fed Funds Rate and the average, 30-year fixed rate mortgage rate has been as wide as 5.25% and as narrow at 0.50%. 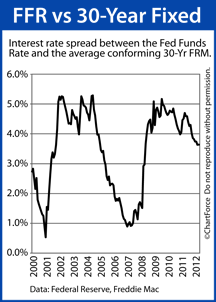 If the Fed Funds Rate was tied to mortgage rates, the chart at right would be linear. That said, the FOMC can influence mortgage rates. After its meetings, the FOMC issues a standard press release to the public which reflects the group’s overall economic outlook. When the FOMC statement is generally “positive”, mortgage rates tend to rise in response. This is because investors often assume more risk in an improving economy and this can harm bond market prices — including those for mortgage-backed bonds. Conversely, when the Fed is generally negative in its statement, mortgage rates can improve. Since the FOMC’s last meeting, there has been little about which to be negative with the U.S. economy. Housing and manufacturing are improving; employment is higher; and global markets are regaining their respective footing. The Fed may make note of it. Or, it may not. Regardless, mortgage rates are expected to move so consider locking your mortgage rate ahead of today’s 2:15 PM ET statement. There too much risk in floating.